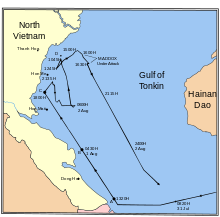 The Gulf of Tonkin incident (Vietnamese: Sự kiện Vịnh Bắc Bộ), also known as the USS Maddox incident, was an international confrontation that led to the United States engaging more directly in the Vietnam War. It involved either one or two separate confrontations involving North Vietnam and the United States in the waters of the Gulf of Tonkin. The original American report blamed North Vietnam for both incidents, but eventually became very controversial with widespread belief that at least one, and possibly both incidents were false, and possibly deliberately so. On August 2, 1964, the destroyer USS Maddox, while performing a signals intelligence patrol as part of DESOTO operations, was pursued by three North Vietnamese Navy torpedo boats of the 135th Torpedo Squadron. Maddox fired three warning shots and the North Vietnamese boats then attacked with torpedoes and machine gun fire. Maddox expended over 280 3-inch (76.2 mm) and 5-inch (127 mm) shells in a sea battle. 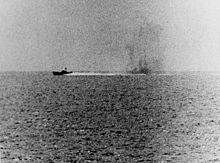 One U.S. aircraft was damaged, three North Vietnamese torpedo boats were damaged, and four North Vietnamese sailors were killed, with six more wounded. There were no U.S. casualties. Maddox "was unscathed except for a single bullet hole from a Vietnamese machine gun round." at 1500G, Captain Herrick ordered Ogier's gun crews to open fire if the boats approached within ten thousand yards (9,150 m). At about 1505G, Maddox fired three rounds to warn off the communist [North Vietnamese] boats. This initial action was never reported by the Johnson administration, which insisted that the Vietnamese boats fired first. 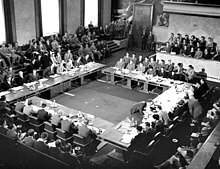 Although the United States attended the Geneva Conference (1954), which was intended to end hostilities between France and the Vietnamese at the end of the First Indochina War, it refused to sign the Geneva Accords (1954). The accords mandated, among other measures, a temporary ceasefire line, intended to separate Vietnamese and French forces, and elections to determine the future political fate of the Vietnamese within two years. It also forbade the political interference of other countries in the area, the creation of new governments without the stipulated elections, and foreign military presence. By 1961, President Ngo Dinh Diem faced significant discontent among some quarters of the southern population, including some Buddhists who were opposed to the rule of Diem's Catholic supporters. After suppressing Vietminh political cadres who were legally campaigning between 1955 and 1959 for the promised elections, Diem faced a growing communist-led uprising that intensified by 1961, headed by the National Front for the Liberation of South Vietnam (NLF, or Viet Cong). The Gulf of Tonkin Incident occurred during the first year of the Johnson administration. While Kennedy had originally supported the policy of sending military advisers to Diem, he had begun to alter his thinking due to what he perceived to be the ineptitude of the Saigon government and its inability and unwillingness to make needed reforms (which led to a U.S.-supported coup which resulted in the death of Diem). Shortly before Kennedy was assassinated in November 1963, he had begun a limited recall of U.S. forces. Johnson's views were likewise complex, but he had supported military escalation as a means of challenging what was perceived to be the Soviet Union's expansionist policies. The Cold War policy of containment was to be applied to prevent the fall of Southeast Asia to communism under the precepts of the domino theory. After Kennedy's assassination, Johnson ordered in more U.S. forces to support the Saigon government, beginning a protracted United States presence in Southeast Asia. A highly classified program of covert actions against North Vietnam known as Operation Plan 34-Alpha, in conjunction with the DESOTO operations, had begun under the Central Intelligence Agency (CIA) in 1961. In 1964 the program was transferred to the Defense Department and conducted by the Military Assistance Command, Vietnam Studies and Observations Group (MACV-SOG). For the maritime portion of the covert operation, a set of fast patrol boats had been purchased quietly from Norway and sent to South Vietnam. In 1963 three young Norwegian skippers traveled on a mission in South Vietnam. They were recruited for the job by the Norwegian intelligence officer Alf Martens Meyer. Martens Meyer, who was head of department at the military intelligence staff, operated on behalf of U.S. intelligence. The three skippers did not know who Meyer really was when they agreed to a job that involved them in sabotage missions against North Vietnam. Although the boats were crewed by South Vietnamese naval personnel, approval for each mission conducted under the plan came directly from Admiral U.S. Grant Sharp, Jr., CINCPAC in Honolulu, who received his orders from the White House. After the coastal attacks began, Hanoi lodged a complaint with the International Control Commission (ICC), which had been established in 1954 to oversee the terms of the Geneva Accords, but the U.S. denied any involvement. Four years later, Secretary McNamara admitted to Congress that the U.S. ships had in fact been cooperating in the South Vietnamese attacks against North Vietnam. Maddox, although aware of the operations, was not directly involved. 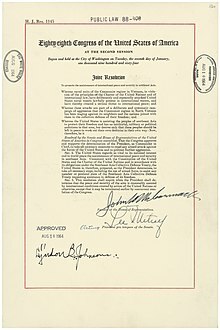 What was generally not considered by U.S. politicians at the time[according to whom?] were the other actions taken under Operations Plan 34-Alpha just prior to the incident. The night before the launching of the actions against North Vietnamese facilities on Hòn Mê and Hòn Ngư islands, the SOG had launched a covert long-term agent team into North Vietnam, which was promptly captured. That night (for the second evening in a row), two flights of CIA-sponsored Laotian fighter-bombers (piloted by Thai mercenaries) attacked border outposts well within southwestern North Vietnam. The Hanoi government (which, unlike the U.S. government, had to give permission at the highest levels for the conduct of such missions) probably assumed that they were all a coordinated effort to escalate military actions against North Vietnam. In July 1964, "the situation along North Vietnam's territorial waters had reached a near boil," due to South Vietnamese commando raids and airborne operations that inserted intelligence teams into North Vietnam, as well as North Vietnam's military response to these operations. On the night of July 30, 1964, South Vietnamese commandos attacked a North Vietnamese radar station on Hòn Mê island. According to Hanyok, "it would be attacks on these islands, especially Hòn Mê, by South Vietnamese commandos, along with the proximity of the Maddox, that would set off the confrontation," although the Maddox did not participate in the commando attacks. In this context, on July 31, Maddox began patrols of the North Vietnamese coast to collect intelligence, coming within a few miles of Hòn Mê island. A U.S. aircraft carrier, the USS Ticonderoga, was also stationed nearby. By August 1, North Vietnamese patrol boats were tracking Maddox, and several intercepted communications indicated that they were preparing to attack. Maddox retreated, but the next day, August 2, Maddox, which had a top speed of 28 knots, resumed her routine patrol, and three North Vietnamese P-4 torpedo boats with a top speed of 50 knots began to follow Maddox. Intercepted communications indicated that the vessels intended to attack Maddox. As the ships approached from the southwest, Maddox changed course from northeasterly to southeasterly and increased speed to 25 knots. On the afternoon of August 2, as the torpedo boats neared, Maddox fired three warning shots. The North Vietnamese boats then attacked and Maddox radioed she was under attack from the three boats, closing to within 10 nautical miles (19 km; 12 mi), while located 28 nautical miles (52 km; 32 mi) away from the North Vietnamese coast in international waters. Maddox stated she had evaded a torpedo attack and opened fire with its five-inch (127 mm) guns, forcing the torpedo boats away. Two of the torpedo boats had come as close as 5 nautical miles (9.3 km; 5.8 mi) and released one torpedo each, but neither one was effective, coming no closer than about 100 yards (91 m) after Maddox evaded them. Another P-4 received a direct hit from a five-inch shell from Maddox; its torpedo malfunctioned at launch. Four USN F-8 Crusader jets launched from the aircraft carrier USS Ticonderoga and 15 minutes after Maddox had fired her initial warning shots, attacked the retiring P-4s, claiming one was sunk and one heavily damaged. Maddox suffered only minor damage from a single 14.5 mm bullet from a P-4's KPV heavy machine gun into her superstructure. Retiring to South Vietnamese waters, Maddox was joined by the destroyer USS Turner Joy. 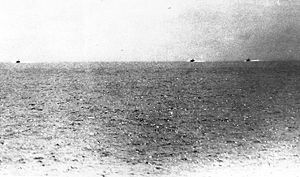 The North Vietnamese claimed that Maddox was hit by one torpedo, and one of the American aircraft had been shot down. At 1500G, Captain Herrick (commander of Maddox) ordered Ogier's gun crews to open fire if the boats approached within ten thousand yards. At about 1505G, Maddox fired three rounds to warn off the communist [North Vietnamese] boats. This initial action was never reported by the Johnson administration, which insisted that the Vietnamese boats fired first. Others, such as Admiral Sharp, maintained that U.S. actions did not provoke the August 2 incident. He claimed that the North Vietnamese had tracked Maddox along the coast by radar, and were thus aware that the destroyer had not actually attacked North Vietnam and that Hanoi (or the local commander) had ordered its craft to engage Maddox anyway. North Vietnamese general Phùng Thế Tài later claimed that Maddox had been tracked since July 31 and that she had attacked fishing boats on August 2 forcing the North Vietnamese Navy to "fight back". However Sharp's claims include some factually incorrect statements. North Vietnam never claimed an 8-kilometer (5 mi) limit for its territorial waters, instead it adhered to a 20-kilometer (12 mi) limit claimed by French Indochina in 1936. Moreover it officially claimed a 12 nm limit, which is practically identical to the old 20 km French claim, after the incidents of August, in September 1964. The North Vietnamese stance is that they always considered a 12 nautical mile limit, consistently with the positions regarding the law of the sea of both the Soviet Union and China, their main allies. Shortly before midnight, on August 4, President Johnson interrupted national television to make an announcement in which he described an attack by North Vietnamese vessels on two U.S. Navy warships, Maddox and Turner Joy, and requested authority to undertake a military response. Johnson's speech repeated the theme that "dramatized Hanoi/Ho Chi Minh as the aggressor and which put the United States into a more acceptable defensive posture." Johnson also referred to the attacks as having taken place "on the high seas," suggesting that they had occurred in international waters. He emphasized commitment to both the American people, and the South Vietnamese government. He also reminded Americans that there was no desire for war. "A close scrutiny of Johnson's public statements ... reveals no mention of preparations for overt warfare and no indication of the nature and extent of covert land and air measures that already were operational." Johnson's statements were short to "minimize the U.S. role in the conflict; a clear inconsistency existed between Johnson's actions and his public discourse." Various news sources, including Time, Life and Newsweek, ran articles throughout August on the Tonkin Gulf incident. Time reported: "Through the darkness, from the West and south ... intruders boldly sped ... at least six of them ... they opened fire on the destroyers with automatic weapons, this time from as close as 2,000 yards." Time stated that there was "no doubt in Sharp's mind that the US would now have to answer this attack", and that there was no debate or confusion within the administration regarding the incident. 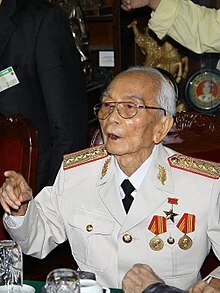 North Vietnam's General Giap suggested that the DESOTO patrol had been sent into the gulf to provoke North Vietnam into giving an excuse for escalation of the war. Various government officials and men aboard Maddox have suggested similar theories. American politicians and strategists had been planning provocative actions against North Vietnam for some time. George Ball told a British journalist after the war that "at that time ... many people ... were looking for any excuse to initiate bombing". According to Raymond McGovern, a retired CIA officer (CIA analyst from 1963 to 1990, and in the 1980s, chairman of the National Intelligence Estimates), the CIA, "not to mention President Lyndon Johnson, Defense Secretary Robert McNamara and National Security Adviser McGeorge Bundy all knew full well that the evidence of any armed attack on the evening of Aug. 4, 1964, the so-called "second" Tonkin Gulf incident, was highly dubious. 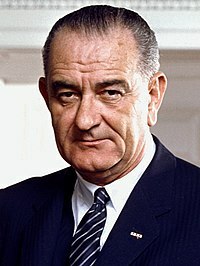 ... During the summer of 1964, President Johnson and the Joint Chiefs of Staff were eager to widen the war in Vietnam. They stepped up sabotage and hit-and-run attacks on the coast of North Vietnam." Maddox, carrying electronic spying gear, was to collect signals intelligence from the North Vietnamese coast, and the coastal attacks were seen as a helpful way to get the North Vietnamese to turn on their coastal radars. For this purpose, it was authorized to approach the coast as close as 13 kilometers (8 mi) and the offshore islands as close as four; the latter had already been subjected to shelling from the sea. In his book, Body of Secrets, James Bamford, who spent three years in the United States Navy as an intelligence analyst, writes, that the primary purpose of the Maddox "was to act as a seagoing provocateur—to poke its sharp gray bow and the American flag as close to the belly of North Vietnam as possible, in effect shoving its five-inch cannons up the nose of the communist navy. ... The Maddox' mission was made even more provocative by being timed to coincide with commando raids, creating the impression that the Maddox was directing those missions ..." Thus, the North Vietnamese had every reason to believe that Maddox was involved in these actions. Provocative action against North Vietnam was considered after the August 1964 incidents. John McNaughton suggested in September 1964, that the U.S. prepare to take actions to provoke a North Vietnamese military reaction, including plans to use DESOTO patrols North. William Bundy's paper dated September 8, 1964, suggested more DESOTO patrols as well. President Johnson commented privately: "For all I know, our navy was shooting at whales out there." In 1967, former naval officer, John White, wrote a letter to the editor of the New Haven (CT) Register. He asserted "I maintain that President Johnson, Secretary McNamara and the Joint Chiefs of Staff gave false information to Congress in their report about US destroyers being attacked in the Gulf of Tonkin." White continued his whistleblowing activities in the 1968 documentary In the Year of the Pig. White soon arrived in Washington to meet with Senator Fulbright to discuss his concerns, particularly the faulty sonar reports. Although information obtained well after the fact supported Captain Herrick's statements about the inaccuracy of the later torpedo reports as well as the 1981 Herrick and Scheer conclusion about the inaccuracy of the first, indicating that there was no North Vietnamese attack that night, at the time U.S. authorities and all of the Maddox's crew stated that they were convinced that an attack had taken place. As a result, planes from the aircraft carriers Ticonderoga and Constellation were sent to hit North Vietnamese torpedo boat bases and fuel facilities during Operation Pierce Arrow. Squadron Commander James Stockdale was one of the U.S. pilots flying overhead during the second alleged attack. Stockdale wrote in his 1984 book Love and War: "[I] had the best seat in the house to watch that event, and our destroyers were just shooting at phantom targets—there were no PT boats there ... There was nothing there but black water and American fire power." Stockdale at one point recounts seeing Turner Joy pointing her guns at Maddox. Stockdale said his superiors ordered him to keep quiet about this. After he was captured, this knowledge became a heavy burden. He later said he was concerned that his captors would eventually force him to reveal what he knew about the second incident. In October 2005 The New York Times reported that Robert J. Hanyok, a historian for the U.S. National Security Agency, concluded that the NSA distorted intelligence reports passed to policy makers regarding the August 4, 1964 incident. The NSA historian agency said staff "deliberately skewed" the evidence to make it appear that an attack had occurred. Hanyok included his study of Tonkin Gulf as one chapter in an overall history of NSA involvement and American SIGINT, in the Indochina Wars. A moderately sanitized version of the overall history was released in January 2008 by the National Security Agency and published by the Federation of American Scientists. ^ a b c d e f g h i j k l m n o p q r s Robert J. Hanyok, "Skunks, Bogies, Silent Hounds, and the Flying Fish: The Gulf of Tonkin Mystery, 2–4 August 1964" Archived 31 January 2016 at the Wayback Machine, Cryptologic Quarterly, Winter 2000/Spring 2001 Edition, Vol. 19, No. 4 / Vol. 20, No. 1. ^ Gulf of Tonkin: McNamara admits It didn't happen. March 4, 2008 – via YouTube. ^ Robert J. Hanyok, "Skunks, Bogies, Silent Hounds, and the Flying Fish: The Gulf of Tonkin Mystery", August 2–4, 1964", Cryptologic Quarterly, Winter 2000/Spring 2001 Edition (Vol. 19, No. 4 / Vol. 20, No. 1), pp. 1–55. ^ Lawrence, A. T. (2009). Crucible Vietnam: Memoir of an Infantry Lieutenant. Jefferson, North Carolina: McFarland. ISBN 978-0786445172, Appendix A, p.218. ^ NRK. "Vi som støtter Amerika – Norges rolle i Vietnamkrigen". NRK. ^ a b c "The Pentagon Papers, Gravel Edition, Volume 3, Chapter 2, "Military Pressures Against North Vietnam, February 1964 – January 1965," second section". ^ "Interview with Phung The Tai, 1981" Archived May 29, 2012, at Archive.today. February 19, 1981. WGBH Media Library & Archives. Retrieved November 9, 2010. ^ a b c Farrell, Epsey Cooke (1998). The Socialist Republic of Vietnam and the Law of the Sea. The Hague: Martinus Nijhoff. pp. 46–47. ISBN 9041104739. Retrieved May 7, 2015. ^ Buchholz, Hanns Jürgen (December 1987). Law of the Sea Zones in the Pacific Ocean. ASEAN Economic Research Unit, Institute of Southeast Asian Studies. p. 47. ISBN 9971988739. Retrieved May 7, 2015. ^ a b Ellsberg 2002, pp. 9–10. ^ a b Ball, Moya Ann (1991). "Revisiting the Gulf of Tonkin Crisis: An Analysis of the Private Communication of President Johnson and his Advisers". Discourse & Society. 2 (3): 281–296 [p. 286]. doi:10.1177/0957926591002003002. ^ "Gulf of Tonkin Incident". August 4, 1964. p. 1. Retrieved October 27, 2009. ^ Text of Lyndon Johnson's speech, Gulf of Tonkin Incident. ^ Cherwitz, Richard A. (1980). "Masking Inconsistency: The Tonkin Gulf Crisis". Communication Quarterly. 28 (2): 27–37. doi:10.1080/01463378009369364. ^ Myers, Clay. Oregon Blue Book. Salem, Oregon: Office of the Secretary of State, 1970. ^ Wise, David (1973). The Politics of Lying: government deception, secrecy, and power. New York: Vintage Books. ISBN 0-394-47932-7. ^ Bradlee, Ben (April 29, 1987). "Deceit and dishonesty – The first James Cameron Memorial Lecture". The Guardian. London. [dead link] The Emperor's New Clothes. Web. October 26, 2009. ^ a b "Action in Tonkin Gulf". Time. August 14, 1964. Retrieved October 28, 2009. ^ Porter, Gareth. "Robert McNamara deceived LBJ on Gulf of Tonkin, documents show". ^ "United States Congress resolution, Pub.L. 88–408, 78 Stat. 384" (PDF). ^ "John White's Letter to the New Haven Register, 1967". Connecticut Magazine. August 1, 2014. Retrieved August 2, 2018. ^ Tim Weiner, Legacy of Ashes: The History of the CIA (New York: Doubleday, 2007), p. 241. ^ a b c Stockdale, Jim; Stockdale, Sybil (1984). In Love and War: The Story of a Family's Ordeal and Sacrifice During the Vietnam Years (1st ed.). Harpercollins. ISBN 0-06-015318-0. ^ "CNN Cold War – Interviews: Robert McNamara". CNN. Archived from the original on June 14, 2008. Retrieved June 25, 2010. ^ "New Tapes Indicate Johnson Doubted Attack in Tonkin Gulf". The New York Times. November 6, 2001. ^ Poteat, S. Eugene (Fall 1999). "Engineering in the CIA: ELINT, Stealth and the Beginnings of Information Warfare" (PDF). The Bent of Tau Beta Pi. Archived from the original (PDF) on May 29, 2006. ^ "Gulf of Tonkin: The Record Set Straight". Fall 2012. ^ the August 2014 issue of Connecticut Magazine Archived August 6, 2014, at Archive.today. ^ Shane, Scott (December 2, 2005). "Vietnam War Intelligence 'Deliberately Skewed,' Secret Study Says". The New York Times. Archived from the original on December 4, 2005. ^ "NSA.gov" (PDF). Archived from the original (PDF) on January 31, 2016. ^ "Spartans in Darkness: American SIGINT and the Indochina War, 1945–1975". Hanyok, Robert J. (2002). Spartans In Darkness: American SIGINT and the Indochina War, 1945–1975. Center for Cryptologic History, National Security Agency. Archived from the original on November 4, 2016. Retrieved December 17, 2018.